Cant make up my mind. Due for new tires. The Hankook Optimos have almost 80k and one had steel showing due to a bad ball joint. My main concern is power, mpg and wearing the front end components out. Truck is an 03 Ranger Edge 3.0 2wd and 4.10 gearing. It would look nicer with 31s but I can live with on 235/75R15 tires. I am still debating all terrains or not if I go stock size but thinking they will look goofy. If I go 31 will be an all terrain. Whats yalls opinion. Most I tow every so often is 2 big four wheelers and more frequently a 14' microskiff. Re: Stock size vs 31? 3.0 Manual RWD before you ask. There should be no extra wear on anything running these, as you are not messing with anything suspension by putting on tires. As for MPG, bigger tires tend to lower that number, but for me it is liveable. I went from using roughly 47% of a tank to 52% when going to a spot about 2.5 hours away. But that is also keeping the speedo at 75ish MPH (bigger tires and non calibrated speedo means I'm going a *bit* over 75) So I'm also burning it faster to drive faster. That brings another point, the 31s will mess with your speedo. And it won't be always X number off, it is an exponential equation opposed to a linear one so the faster you go the more it will be off. You can fix this by paying someone to recalibrate it (dealer?) Or by getting a program or software to do so yourself (I plan on using Forscan). As for towing, I have not had any issues doing any heavy duty towing. 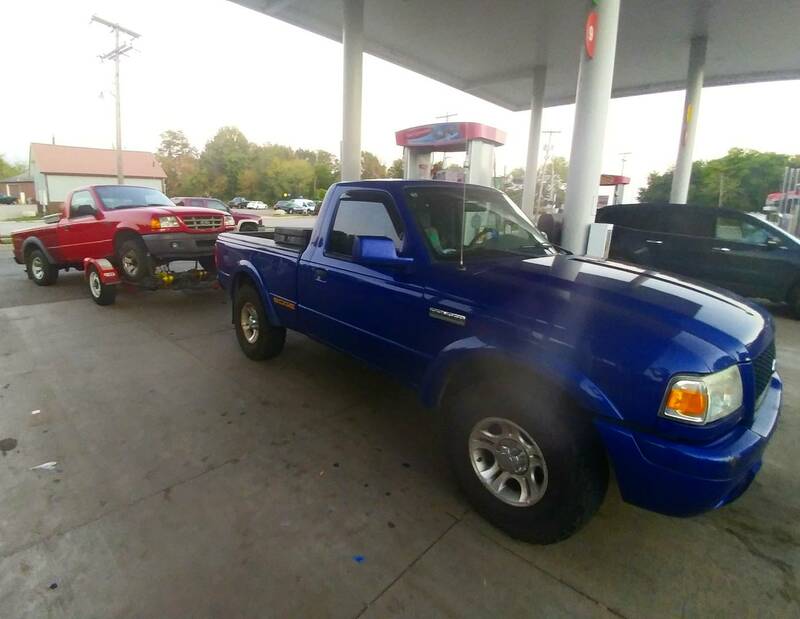 Pic below shows the most recent thing I towed (which is like 2 or 3 times what I am "supposed" to tow according to Ford) and the tires did not hinder me in any way. These tires are heavier than stock size too which means they are more effort to stop, so with stock drum brakes towing this may have made it a pain to stop but while not towing there is no huge difference. Edit: when spending good money to buy new tires it will be worth it to get an alignment as it sounds like one is needed. If you got 80,000 miles out of a set of Hankook tires, you are doing WAY better than most on cheap Asian tires. Larger than stock tires will rob fuel mileage to a certain degree and give a busier ride. I wouldn't put LT tires on either. Every 31 I find is an LT tire. A 265/75R15 is as close to 31x10.50 I can find in a P rated tire. Nothing wrong with LT tires but on compact size Rangers they ride pretty rough compared to P rated rubber. If ride is important, go with the 265s. 80,000 miles out of a set of tires is absolutely amazing, good luck with whatever you choose! Had them installed yesterday. 31x10.50-15 Cooper AT3 Discoverer. Will get pictures today when I pick up the truck. Looks alot better than I thought.